This year, I’ve been one of those obnoxious girls with a “birthday week” – I just got lucky I suppose. From a party at work to a much-anticipated child-free dinner out, from besties sending unexpected presents to our luxurious night away while my parents babysat. It’s been a great birthday week. One such unexpected present arrived on Wednesday. It’s a candle that smells like birthday cake, and somewhere inside of the candle is a gold-foil-wrapped ring, which is worth anywhere from $10 to $5000. You have to burn it to find the ring, and this is a pretty hefty candle – I’m guessing it’ll take hours of burning to get to the buried treasure. I texted the person who told me she had sent me something in the mail – but it wasn’t from her. I texted the person who was most likely to have found a product like this on the internet – but it wasn’t from her. I texted some of the girlfriends I could think of who are thoughtful enough to send a birthday gift – but it wasn’t from any of them. I texted my brother (sort of a last resort) – but it wasn’t from him. 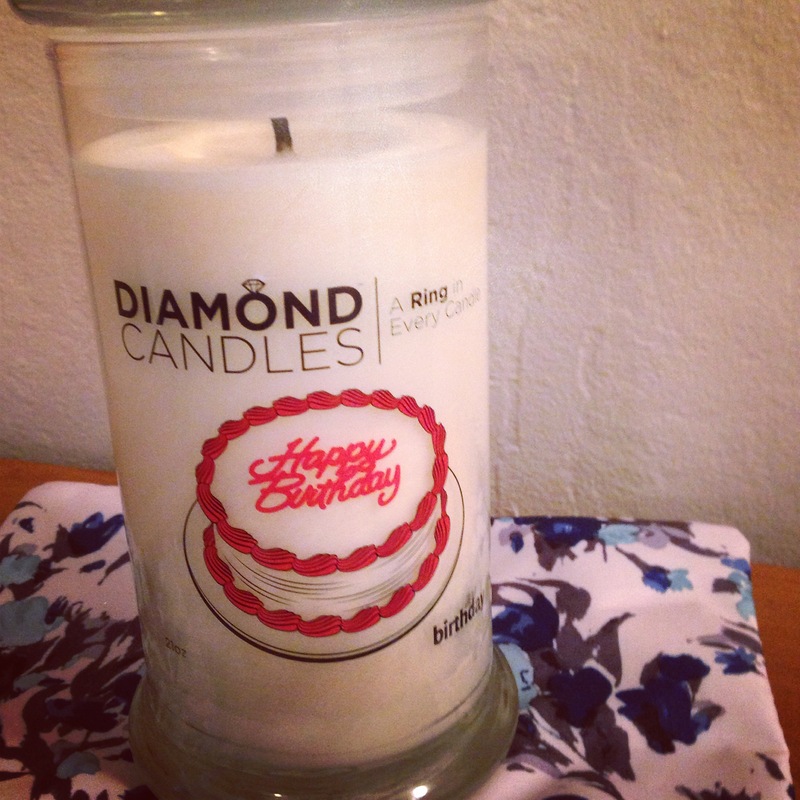 So my question is: who sent me this diamond ring candle? for posterity—or you—to pick up. & ask them for the strongest drink they have. I just pulled it out of my purse. It’s open to the week of October 28. Also, Drew and I had a wall calendar this year, which we actually used. And that makes more sense, since it’s accessible to both of us. I guess my purse planner has been replaced by a combination of kitchen wall calendar and iPhone calendar…which I hate to admit, but there it is. The thing is, I can put appointments into my phone, and they’ll show up on my work calendar as well! Which is very helpful. So, I guess I don’t have a dilemma, so much as I have a sad fact to face: 2014 is gonna be the first year in many years that I don’t bother buying a planner for myself. Even though it was $4 at Barnes & Noble, and very cute. Did I mention it was covered in polka dots? Happy New Year! Let’s raise a glass to 2014 and to moving on, however (un)willingly we do so. 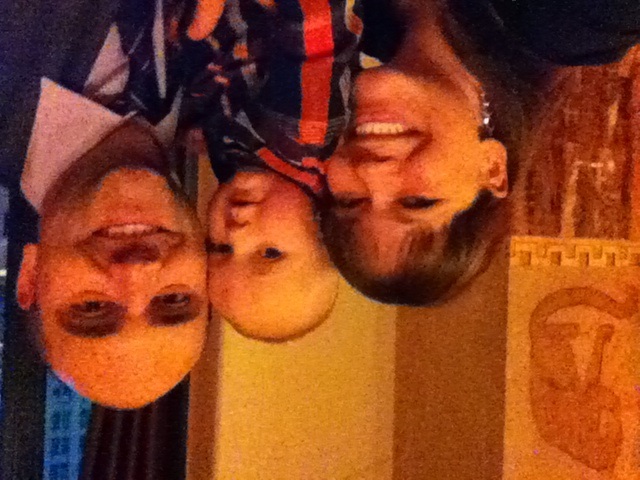 A couple weeks ago, we took B to a wedding. A francy wedding. As a bonus thing to worry about, our car situation meant we were taking my parents’ bug, which is stick, so I had to drive. We left plenty of time to get ready, get everything in the car, and get to SF. We got there about 10 minutes before 3:00, which was perfect. We parked right outside the church, which was perfect. I hopped into the backseat to pull B out of his carseat…and was greeted by an absolutely remarkable smell. We opened the trunk (do you realize how small a VW bug trunk is??) and laid him down in it, button down shirt and all, to change his diaper. It wasn’t until I had the diaper half off, and Drew was digging through the diaper bag looking for the wipes, that I remembered I had used up the last wipe and forgotten to put a new package in. There were some exclamations of dismay. I mean, we were on the side of the road, outside a francy church, dressed in our best, trying to change our squirmy child in a trunk, and we had no wipes. Luckily we had pacifier wipes, so we survived. We were sitting down for about 4 minutes, and the family members were being escorted in, when B opened his mouth and let out a “Aawwwk?” And then his eyes got big and he looked around, as he realized what a great echo there was in here. I jumped up and tried to jiggle him to keep him occupied, but once he started squawking, there was no turning around. We saw the bride come in, and then I ended up taking him out to the narthex, where we walked back and forth for the entirety of the service. Sometimes we went outside. But B was smack in the middle of wanting to walk everywhere but needing to hold hands, so I spent an hour alternating between being kind of hunched over, and tossing his 25 pounds into the air to make him laugh. After the service, we had all this time to kill, and we thought if we drove around he might take a nap in the car seat. Well, we were wrong. So we drove all around San Francisco, went up to Twin Peaks and got gas, and got caught in the worst ever traffic on the way downtown to the financial district, where the reception was. Despite being the most anxious about the reception, it was actually really lovely. As soon as we got to the table, one of the waitstaff came over and said, “Do you want a high chair?” and Drew and I were both like, “YOU HAVE HIGH CHAIRS? ?” Also, the first toast of the evening was by the bride’s father, and rather than being champagne, it was a tequila shot with cinnamon and orange. So good. B lasted for a really long time before he started melting down (like 9pm – like 2 hours after his usual bedtime) – although right at the moment when we decided it was time to get him out, they started other toasts, and then one of the bridesmaids gave like a 15-minute toast and were trapped on the side of the room opposite the door. Anyway. B’s first wedding, and it was francy, and it was inside a Catholic church, and it was late at night. And he did great! I’ve been threatening to take some laundry to the Wash & Fold down the street for months now. If you’re unfamiliar, a Wash & Fold is the real meat of a laundromat – you drop off your laundry and then pick it up again several hours later, and it’s all clean and folded and bagged for you. Drew used to do it in New York all the time – I’m talking gigantic bags of laundry. I never did it, but I think I was a little more regular about just using the laundry room in our building. We don’t have laundry facilities in this building, and we typically take our stuff to Drew’s parents’ house and do a bunch of wash there if we’re hanging out. But these days, with the additional loads of baby clothes/supplies, it just seems to be piling up. I’ve gotten into a habit of skimming off the top layers from my laundry basket, like the stuff I actually wear regularly, and just washing that. 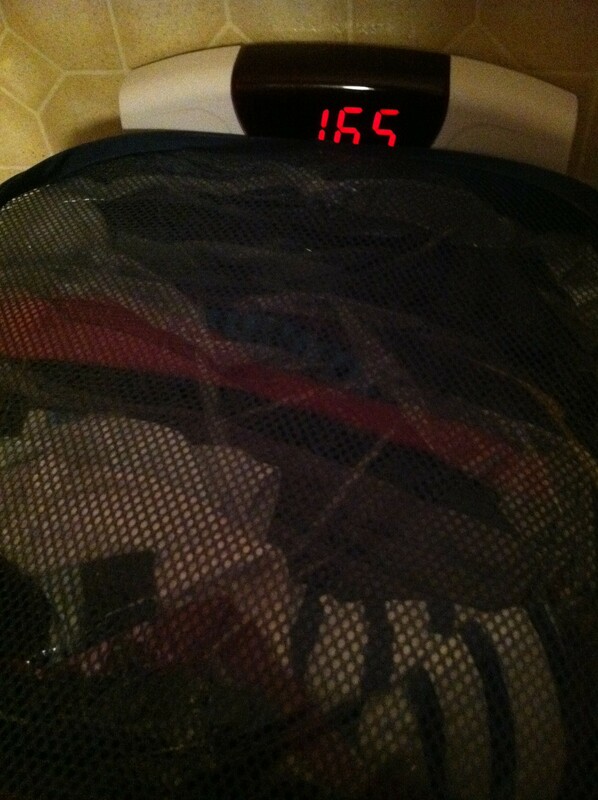 Which means that layers of forgotten clothing and towels accumulate on the bottom of the basket. True-Life Example: Sometime around the end of February, we finally sucked it up and did all our laundry that was sitting around. At that point, I found, at the very bottom of everything, the pajamas I wore for Christmas morning pictures. Yikes. So. Today I was getting things done and taking names, and one of the things I decided to get done was to take the tier-3 laundry that was still in my closet, and drop it at the Wash & Fold. The drop-off went okay. She didn’t put my name on it or anything, but I assumed it’d be okay. And she wrote down my name (maybe?) and my phone number. She told me to come back “later this afternoon.” I was pretty jazzed thinking that by the end of the day, all my clothes would be clean and I would have spent my time on work and other chores. I went back this evening to pick it up, and a different woman told me it was twenty bucks. Cue exclamation points in my head, but then I guess that’s 16 pounds, and I’m not great with guessing weight, so I guess it might weigh 16 pounds. I tried to hand her my card but she just looked at me and said, “It’s cash only. Didn’t she tell you that?” Ugh, no she did not, and now I have to drive all the way to the ATM to get money because I really need these jeans for tomorrow. When I got back, I was a little grouchy, mostly because I sensed that my side trip to get cash was going to cost me the parking place right in front of our building. I walked inside and attempted to find the same woman. She wandered over to the counter and asked me where I went to get cash. I was like, Seriously? Just give me my clothes. Then she told me I could have just gone to the ATM at Winters, a bar a few blocks away. Now, I have a thing where I really want to use Bank of America ATMs, since that’s my bank and my card, and it’s not like I had to drive 10 miles to find one or anything. So, I got my stuff and I got home and I had to get another, slightly farther away parking spot, but it’s still all okay. 2) I kind of have a method of folding that I prefer. And it’s not like it’s great folding, or anything, but it fits with the way the rest of my stuff is folded, so I like it. So goodbye, Wash & Fold. We probably won’t do business together anymore. I was so proud of myself this morning. I guess pride do goeth before a fall. 16.5! I guess they weren’t swindling me after all. The other night the three of us were driving back from Lodi and listening to a CD I found in my CD case with no label, no name, and no track list. It could have been anything. What it ended up being was a pretty good mix of the kind of classics that most people are sure to know: American Pie, Manic Monday, For the Longest Time, Fast Car, Tom’s Diner, etc. A pleasant surprise…a lot of those unlabeled CDs end up being much worse. I was in line, up next, and watching Ariel interact with the little girl ahead of me. She said, “Okay, now smile at the – what do you call it? – photographer!” and I thought that was so sweet. She was made of big arm gestures and smiles and hair flips. When I got up there though, she was all business in a bad wig. She smiled for the picture but where was all the cutesy stuff? That’s okay, it would have been worse to be patronized. But the photo that came of it – awkward 13-ish-year-old me in a t-shirt and shorts and sandals with socks (oh man, I sat just now and debated including that, but you know, the truth will out) – is all the more embarrassing because of the big gap between the two of us. Every so often, that photo resurfaces in my “stuff from the past,” and each time I debate throwing it out. Seriously, I don’t know if I need to say this again, but it is a really embarrassing picture. There is no possible reason I could ever want to show it to anyone, or look at it myself. But I just haven’t gotten around to getting rid of it. Maybe someone can tell me why.